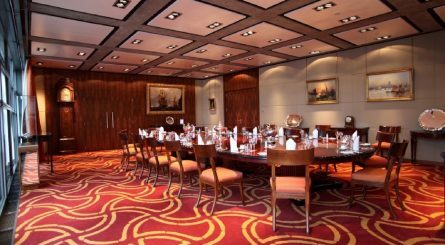 Private dining rooms in The City of London provide a discrete environment for business meetings as well as corporate lunches & dinners. The City of London, also traditionally known as The Square Mile, is situated between Shoreditch, Holborn and Clerkenwell to the north, Hackney and Whitechapel to the east with the Thames to its south. One of the principal centres of global commerce, The City is home to many of the world’s leading financial, banking and insurance companies as well as The Bank Of England and The Stock Exchange. The City has an enticing mix of small pubs and upmarket bars together with an excellent selection of restaurants with private dining rooms. The City has many fine e landmarks including Leadenhall Market, The Monument and the The Royal Exchange. The City of London is well served with mainline stations such as Liverpool Street on Bishopsgate, Fenchurch Street, near The Tower Of London and Cannon Street as well as underground stations such as Liverpool Street, Bank, Moorgate and Tower Hill. 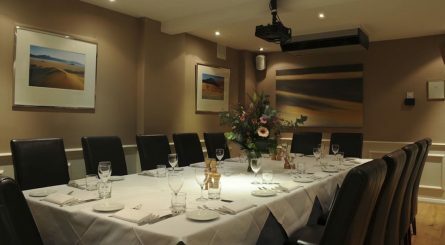 If you are looking for for a private dining room in The City, at www.privatediningrooms.co.uk we offer a great range of dining rooms available to hire for private lunches and dinner events. 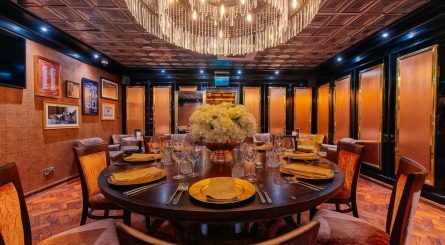 The Vault private dining room in Leadenhall Street in the City of London accommodates up to 24 seated guests or up to 80 guests for standing drinks receptions. The mezzanine private dining room at London Steakhouse – City in Spitalfields – just a few minutes walk from Liverpool Street station in The City – has its own bar and seats 8 – 20 guests. The Dining Room at Coopers’ Hall in Devonshire Square – close to Liverpool Street station in The City – can accommodate up to 34 seated guests for private dining events and up to 50 guests for standing drinks receptions. 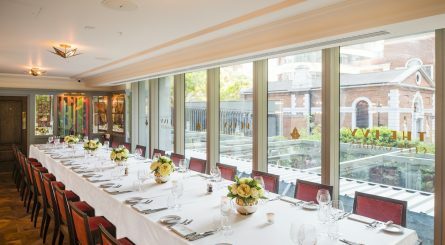 The private dining rooms at The Don can accommodate 16 – 50 seated guests for private dining events in The City of London as well as standing receptions for 30 – 65 guests. 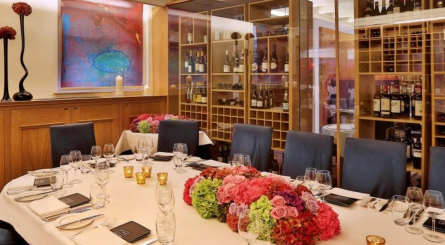 Located just two minutes walk from Liverpool Street station, the private dining room at The Ivy City Garden seats up to 24 guests on one long table or up to 32 over four round tables of ten. The room is also available for standing drinks receptions of up to 50 guests. The two private dining rooms at Manicomio City can accommodate up to 40 & 60 seated guests or up to 100 for standing receptions. 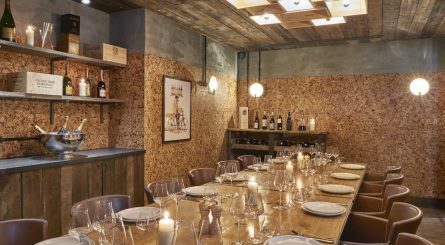 Taberna Etrusca is an established Italian Italian restaurant in the heart of the City of London with a popular private dining room able to accommodate up to 30 seated gUests. Restaurant exclusive hire also available for up to 100 seated guests. 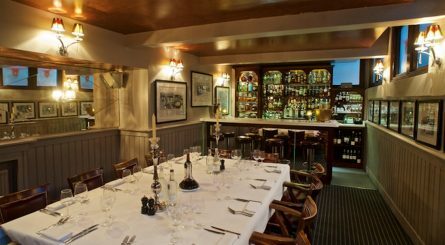 The private dining rooms at The Oyster Shed seat 30 – 60 guests and can also accommodate 24 – 120 guests for standing drinks receptions. Semi private spaces can accommodate 16 – 40 seated (25 – 60 standing) guests. Exclusive hire for 200 seated / 400 standing guests also available. 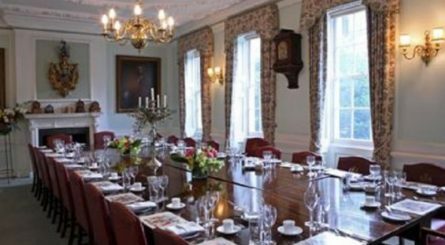 Lloyd’s of London in the heart of The City has a selection of rooms available for private dining events of 26 to 200 seated guests & standing drinks receptions of up to 400 guests. Cabotte restaurant in the heart of The City of London has two private dining rooms seating up to 11 and 18 guests. The larger private room can accommodate up to 40 guests for standing receptions. 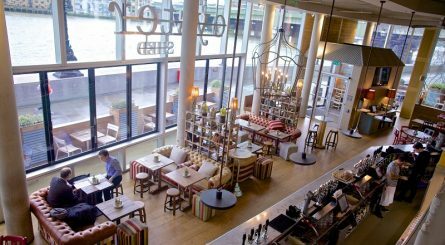 The Walbrook Club is located in the heart of The City Of London, close to Bank station, and has private dining rooms that can accommodate 10 – 40 seated guests or 20 – 70 guests for standing drinks receptions. 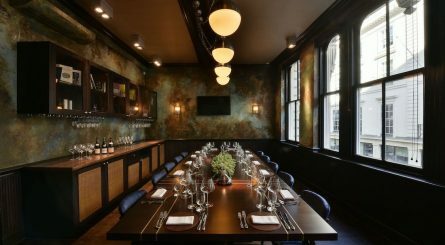 The cork walled private dining room at Humble Grape in St. Bride’s Passage, just off Fleet Street, is located in the crypt and seats up to 16 guests. 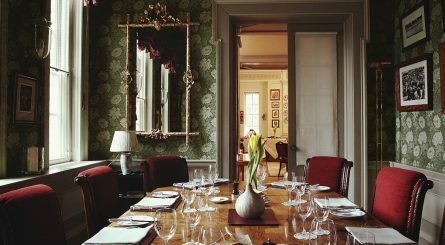 If you’d like some free one-on-one help finding the perfect private venue for dinner, lunch, breakfast or afternoon tea, contact us for a personalised recommendation. Packed full of private dining offers and incentives from leading London restaurants.